Well, if you trace the history of something called corporate “personhood,” you can blame this inglorious recognition on an unelected clerk writing a summary of a court decision that never actually decided this issue. How it got used by corporate lawyers during the age of the Robber Barons is another story. But, corporations were never intended to be given all the rights of “people.” Abraham Lincoln, who was a driving force for the passage of the 14th Amendment empowering all people with the protection of the federal government, would be turning in his grave on learning the due process equal protection clause was eventually used by some “slave-driving” Big Business corporation of the late 19th Century. Republican Presidential Candidate Mitt Romney recently touted the infamous quote above, defending corporations and thereby supporting the US Supreme Court decision in Citizens United v. Federal Election Commission ruling that corporations are “people” with rights to spend unlimited (and undisclosed) amounts of money for political speech under the Constitution. The Court said such action would not have a corrupting influence in politics. I don’t know what world the five justices were living in when they voted on its narrow 5 to 4 decision, but I don’t believe they foresaw the negativity states would be carpet-bombed by election ads over the next two years. The first reference to a corporation as an “individual” occurred on Feb. 2, 1819. The state of New Hampshire tried to break a contract the King of England entered into with a college before the United States was formed some 50 years earlier, granting a charter for the school. Daniel Webster, an alumnus of Dartmouth College, argued an incorporated college should be treated as an “individual” under contract law, and Supreme Court Justice John Marshall agreed. Fast forward some 70 years and the court heard yet another case involving a state whose legislators tried to impose a tax on railroads. Lawyers for the railroad tycoons fought the state of California all the way to the Supreme Court which sided with attorneys for the industrial giants. They said that a state could not alter a law created by the federal government and did not have the right to a newly created state tax. Headnotes are not the work of the Court, but are simply the words of the reporter, giving his understanding of the decision, prepared for the convenience of other lawyers. The clerk, by the way, was the former president of the Newburgh and New York Railway Company. Lawyers picked up on this non-decision and used it to their wealthy clients’ advantage, thereby building up and sustaining a fiction over the years that neither the framers of the Constitution nor its most revered Civil War champion ever imagined. This entry was posted in anger, Occupy Wall Street, Politics, understanding and tagged Compromise, culture, Elections, equality, musings, Occupy Wall Street, Peace, Politics, relationships, thoughts. Nice exposition of the derivation of this ludicrous, shameful idea………… I wonder if those who believe in this idea would STILL believe in it if the corporations — acting in their ‘personhood’ — were the ones who hold their medical-power-of-attorney, & had the right to take them off of life support! That is one scary thought, MindMindful. I wonder if money would enter into their calculations for pulling the plug? Nah. 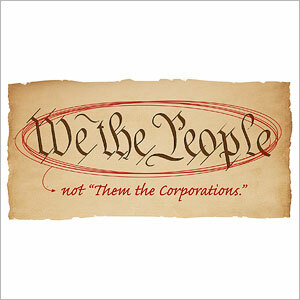 “Corporations are people, my friend.” They feel the same way as you and me, don’t they? I have to say, not only am I outraged that courts are buying this whole “corporations are people” drivel (when corporations aren’t subject to punitive laws, such as imprisonment for crimes), but I also can’t wrap my mind around the fact that giving money to a political candidate is now considered a form of “speech”. I recently learned that a corporation tried to use an individual’s “right to remain silent” as a right to prevent its members from testifying under the grounds that it might incriminate them. Even the most Big Business-oriented Supreme Court would not go that far, and declined to grant the status of “people” to corporations under the 5th Amendment safeguards and protections. Michael “Ozzie” Myers in 1980 was the first member of the House of Representatives to be expelled since the Civil War, and ended up serving three years in jail. Now, that’s what I call using money as a real form of speech! I appreciate your explanation of the history of this term. I wondered what the fuss was about and this sheds some light on it. We have to continue being people who ARE heard. We need to become more and more creative. We needed amendments to the Constitution to change this god-awful law, and the northern states passed three amendments — the 13th, 14th and 15th amendments — after the southern states seceded from the Union. The 14th Amendment applied the Bill of Rights to all the states, granting “people” of all states the same rights our founders envisioned in a federal union. It made the Bill of Rights applicable to all people, despite any “states rights” issue an individual state might have tried to enforce, for example, its so-called “right” to own slaves. How something that was meant to end slavery and help the disadvantaged got turned into a tool for the most well-advantaged in society mystified me while studying this in law school. Lawyers of wealthy clients used the 14th Amendment to create “personhood” for corporations, and our Supreme Court has rubber stamped more and more “individual” rights for those entities ever since. It is up to us to become “We the People” once again. “We the People” means you and I and other individuals, not groups with so much power it makes a mockery out of the “one man, one vote” rule. Sadly … money is everything. The presidency is for sale. This country has been turned inside out and makes a mockery of itself. Some say a Constitutional Amendment might be needed to get this type of money out of politics, or a Congress that is not afraid of rising above its individual interest to set controls for the good of the country.